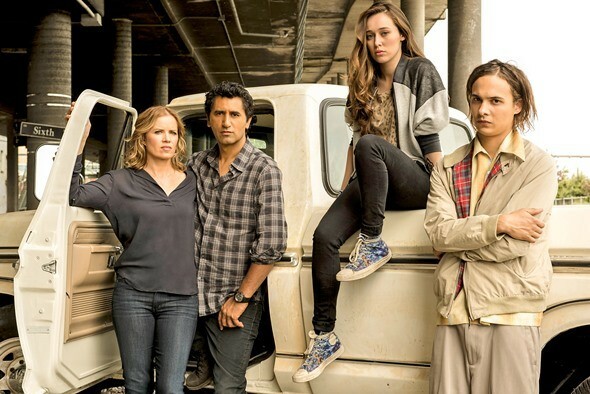 Fear the Walking Dead star, Kim Dickens (Madison Clark), tells Digital Spy that she is up for a crossover between The Walking Dead and its new, hit spin-off, both of which air on AMC. Originally, Dickens thought a crossover was impossible, but seems to have changed her mind. “I think we were just sort of led to believe early on that there was no crossover – it was a little bit different time period, a different story, different location, different characters,” she told ​Digital Spy​. Fear the Walking Dead is not Dickens’ first rodeo, nor is it her first big TV show. In addition to appearing on the Netflix series, House of Cards, Dickens has had roles on several now-ended or cancelled TV shows including Sons of Anarchy, Treme, Friday Night Lights, and Lost. What do you think? Would you like to see a crossover between AMC’s Fear the Walking Dead and The Walking Dead TV shows? How would you envision it working? More about: Fear the Walking Dead, Fear the Walking Dead: canceled or renewed?, Friday Night Lights, Friday Night Lights: canceled or renewed?, House of Cards, House of Cards: canceled or renewed?, Lost, Lost: canceled or renewed?, Sons of Anarchy, Sons of Anarchy: canceled or renewed?, The Walking Dead, The Walking Dead: canceled or renewed?, Treme, Treme: canceled or renewed? A crossover would be very interesting! How do you see it playing out, Rose?